Our hero Phantomas spends his 25th birthday "jumping in a trampoline with a naked woman eating tortilla," until, in a fit of randomness, he changes tact, pulls out his encyclopaedia, and entertains himself reading a bit of galactic history instead. He reads about the old Metro City, an ancient place famed for its arts, culture and wealth. Now a mouldering ruin, he discovers it is awash with gigantic gold coins. An alternative birthday celebration occurs to him: he will travel to Metro City and go "back to his old ways." By which he means, steal a sackful of gold! This, indeed is the object of the game. This rudimentary plot tells me two things. One: authors The Mojon Twins do not let anything so distracting as a decent storyline get in the way of a good game. Two: I really need to revisit how I celebrate my birthday this year. I am going to say something controversial now. The old Speccy, bless her heart, lacked decent platformers. Or certainly, the good ones were few and far between. Some of the acknowledged classics were just far too difficult and unforgiving. 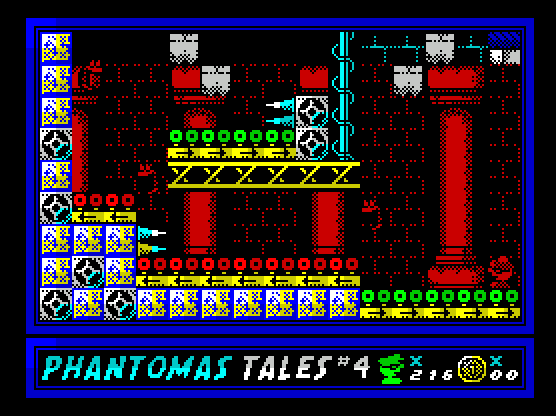 Early platformers like Manic Miner and Jet Set Willy frustrated rather than entertained, and many others relied too heavily on pixel-perfect jumping to challenge the player. By the time platform games had their resurgence, with Super Mario Land and then Sonic the Hedgehog, the Spectrum had had its day. I like to think that Severin Sewers redresses the balance just a tiny bit. It's a creatively designed, challenging, platform-based collect-'em-up – and its difficulty level is pitched just right. 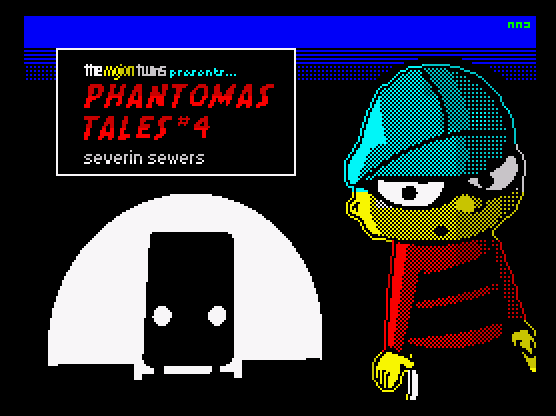 Severin Sewers plunges you straight into the action; you begin the game in the darkness of the deepest sewer, with only a halo of light around Phantomas to navigate by. Being unable to see far, exploration is done gingerly at first, and great care needs to be taken not to fall into the goblin snot at the bottom of the sewer that quickly saps our hero's energy. Beasties such as bats, apes and knights, amongst others, populate the sewers and the ruined city and will drain Phantomas' stamina if they cannot be avoided. Just as I was thinking that this game was going to be a tough nut to crack, Phantomas emerged from the sewers and into the daylight. The light makes progress a whole lot easier; the game's main challenge is navigating the sewers and finding the coins that are hidden there. Each of the four levels is made up of a 5x5 grid of flip-screens, with ten gloomy sewer screens and fifteen above ground. The objective on each level is to find all fifteen giant coins; as soon as you get them all, you are transported to the next one. Phantomas must also navigate moving conveyor belts, spiky obstacles and of course make the odd precarious leap. You start each level with 200 energy, which can only be replenished if you come across a burger lying in the dust. Nothing in the game can kill you outright, it can only drain you of power until you die of exhaustion. This means no frustrating repeated deaths in the same spot, and allows you to make mistakes and recover from them, which makes for a positive gaming experience. It doesn't, however, mean the game is easy. You have to be careful to preserve your energy as there is always the chance you will fall in the gloop as you search for coins at the bottom of the sewers. There are two things I really like about this game. Firstly, the limited visibility in the sewers gives those screens a suitably lonely atmosphere and creates an unusual gaming challenge. Secondly, the elegant controls (left, right, high jump and long jump) which feel natural almost straight away. The two different types of jump add a dimension that most other platform games lack and keeps the gameplay interesting. The graphics are good quality, especially the attractive backgrounds which give you a sense of the ruins of Metro City, from a deserted train station, to grand buildings and temples. Sprites are small but still full of character. The music and sound effects are spot on, with a different tune for each level that helps to give the game the right feel for one set amongst spooky ruins. Overall, the presentation isn't quite up to the standard of the Mojon Twins' recent Maritrini, but good nonetheless, and I would certainly recommend this as superior in the gameplay stakes. Each of the four levels is cleverly designed; they are not linear and you never feel constrained by the fact that the screens are arranged in a grid (in fact you barely notice it). My only complaint is that the game is slightly too short and I think an additional two levels would have made all the difference. Now I've competed Severin Sewers it's time to plan some birthday high jinks... Anyone for tortilla? Download the game here (from The Mojon Twins site).